A book already holds a distinct story. But when you walk into a used bookstore the stories seem more real than before. I never truly understood the concept of buying used books until the day my mother took me to one. Piled upon each other they rose towards the ceiling, an adventure on its own to find the treasure – the right book. That day I bought a dozen books. Those out of print and some just looking for a home – a homeless good story. My nose pressed to the pages held a completely new smell. Musty and old. Grease marks, pen marks, scribbles of notes, autographs, dedications and dog ears. A story within a story was present as I read the different dedications – mother to daughter, proclamations of love, friend to friend. New books do not hold that extra story. Digital books fail to bring companionship. Just the thought of someone else reading the same book, the same page as me makes all the difference. The musty smell of history and lives lived is incomparable. 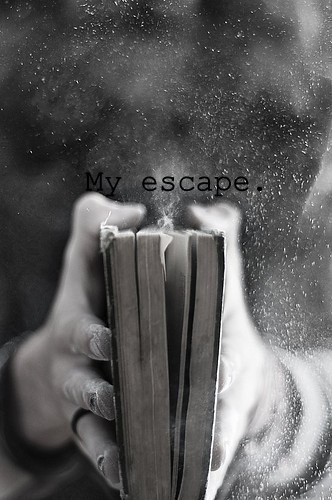 When I open a book I expect for the story to blow me away. Break a dandelion, bring it close and just blow. So, that every little piece goes flying, floating in the air. Waiting to cling onto another’s sweater, coat, and dress. The stories cling to me like a second skin. If you look close enough I relive the scars of characters, rich with depth and ingenuity. My laugh lines match theirs. Their happy ending becomes mine. Especially good books tend to evoke emotions in me that even I don’t understand. Strung together like beads in a necklace, pull too hard and they’ll fall apart. Break away and release. Keep them tethered close and your fear of losing them runs dry. I, too often, find myself crying tears of joy and sorrow. The character’s pain becomes my pain. And suddenly, the world seems different. I see everything through the lens of a kaleidoscope and I know. My feet fill their shoes and I imagine myself as them. In that moment, I am ready.